Bookbooks Publishing LLC, 9780999782712, 308pp. Nothing is ever what it seems in this riveting science fiction dystopia about a future society's frightening overdependence on technology. A powerful debut from award-winning journalist Shari Lopatin, "The Apollo Illusion" is a must-read for today's older teenagers and young adults. The year is 2150, and bullied nineteen-year-old Flora can no longer ignore the burning curiosity to learn what's behind the towering Wall surrounding her home state of Apollo. Citizens still read books, discuss philosophy, and send text messages, but questioning The Other Side is forbidden. When Flora's na vet accidentally reveals a dark secret about Apollo, she's forced into an isolated web of truth, lies, and survival. Fearing for her life, she leaves behind a clue for her childhood friend, Andrew, placing her last hope in their special bond. 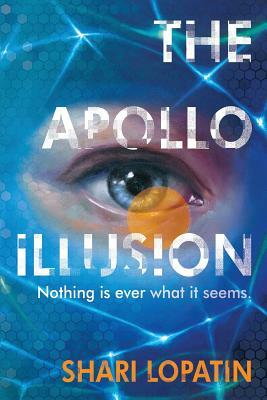 "The Apollo Illusion" is a story for the hackers, the techies, the seekers, and the rebels of the world. Shari Lopatin tells stories that matter. An award-winning journalist in her earlier years, she now writes complex and stimulating suspense novels that tie into modern-day social issues. Shari has worked as a newspaper reporter, magazine writer, public relations professional, social media manager, and earned the title of "Cat Mom of the Year."